"In 1931, The New Yorker reported on a circle of dough that was becoming an exponentially popular phenomenon: 'Doughnuts float dreamily through a grease canal in a glass-enclosed machine, walk dreamily up a moving ramp, and tumble dreamily into an outgoing basket. Twelve hundred doughnuts an hour are turned out.' The writer was describing a doughnut machine that had been created just eleven years before, by an inventor named Adolph Levitt. In just over a decade, he’d built a twenty-five-million-dollar-a-year business selling them. 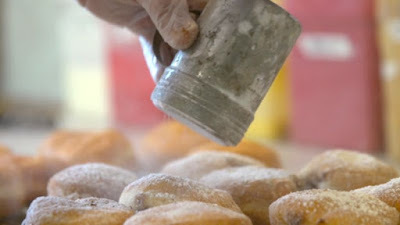 The few employees of Dough, a bakery in the neighborhood of Bedford-Stuyvesant, Brooklyn, cut circles of dough by hand, punch out the holes, and fry them in a small vat of oil, just one tray at a time. Since its opening, in 2010, Dough has gained a cult following, and, while the owners are itching for more space ('We’re really quite tight in here. It’s hard. '), they’re hesitant to expand and compromise quality. ..."